← Has clearcutting on Crown land in Nova Scotia increased or decreased? 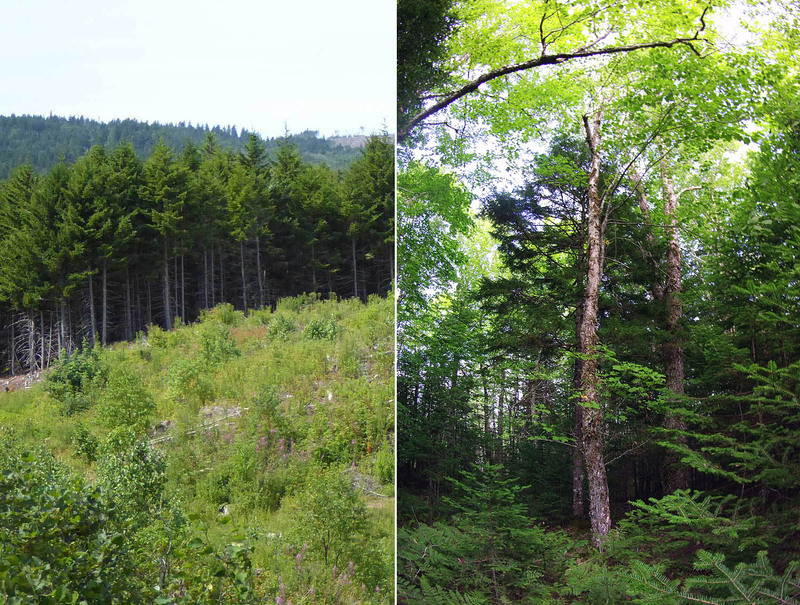 Two woodlots in Nova Scotia. Definitely clearcut (left foreground) and definitely not-clearcut (right), but what about the even-aged, conifer dominated stand in the background at left – was it produced by a “clearcut” or a “partial cut”? Does it matter? Formally, NSDNR defines a clearcut as “a forest harvest where less than 60% of the area is sufficiently occupied with trees taller than 1.3 meters”. That may be a bit difficult to grasp, but NSDNR provides photographs of recently cut stands that qualify and don’t qualify as clearcuts. Under this system, CC, OR and ST are classified as “clearcuts”, while SW, VT, CT and SH are are classified as “Partial Cuts”. In both systems, Selection Harvests, and Commercial Thinning are not counted as clearcuts. I assume “Variable retention” in the NSDNR system is considered a Partial Cut; there is no corresponding classification in the NFD system. I would describe the Nova Scotia definition as a “restricted definition of clearcuts”, and the NFD definition, a “broader definition”. Which definition is used matters. It matters percentage-wise, it matters in regard to what it does and it matters in regard to how the public understands what is a clearcut and what is not a clearcut. So let’s look at some numbers and percentages based on National Forest Database (NFD) info. 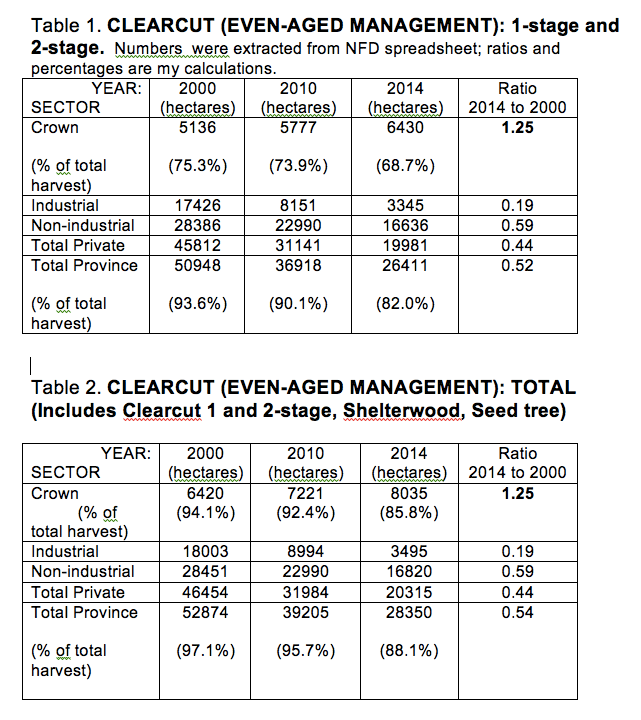 By the restricted definition (but including “2-stage clearcuts”), clearcutting was 68.7% of total cutting on Crown land in Nova Scotia 2014. By the broader definition, it was 85.8%. Most of the difference was made up by shelterwood cuts. When many Nova Scotians expressed a desire for less clearcutting in the Citizen Engagement phase for development of the Natural Resources Strategy, I am pretty sure most of them were thinking in terms of the broad definition. They wanted to see more of the natural, mixed, multi-aged Acadian forest in Nova Scotia and less of the even aged industrial forests maintained by clearcutting of all sorts. This blog post is the 2nd of three in a series that explore the apparent contradiction between public concern about clearcutting in Nova Scotia and NSDNR reassurances that clearcutting has been reduced and that “all harvest treatments are aligned with the nature-based requirements of Nova Scotia’s lands”.